Every child should attend the school to attain minimum level of education, each and every school should have teachers, improved infrastructure facilities, all these to improve quality of education efficiently and effectively it should start from primary education. 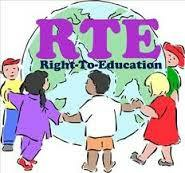 Providing quality education to children who belongs to disadvantaged group and also to weaker section is the essence of introducing Right to Education, if the child belongs to Scheduled Caste or Scheduled Tribe, socially and educationally backward class or any other group the RTE strengthen their presence in the society. Candidates are advised to contact the concerned Social Welfare Department to fetch more details. Candidates who belongs to weaker section category may claim whose parents or guardians' annual income from all sources is less than Rs.3.5 lakhs per year, however Social Welfare Department has described educationally and socially creamy layers in detail in its guidelines. Parents or guardians required to keep in mind the below mentioned points before availing RTE. Parents/Guardian bound to produce all the original documents for verification like Adhar Card etc. In case a student is selected and admitted in the nearby schools which is earmarked with 25% quota of schools under Right to Education 2018 by the Government in such cases the candidates completely exempted from paying any admission or fees of any kind. The 25% quota is applicable only to those students who seek admission where they come under the age of 6 years, this free education available to the child till it attains 14 years of age or completion of 8th standard whichever comes early. Government of Karnataka has introduced a program called Prathibha Karanji which is an extended program for students of Primary Education who admitted under RTE Act. This program helps the students in bringing out the hidden talents in terms of entertainment or education in turn helps in personality development, the program is a platform to gain and acquire hidden talents in a competitive spirit wherein a student can gain exhibiting capacity through extracurricular activities. Prathibha Karanji program is meant for children who are studying in Class 1 to 4 and Class 5 to 7 classes where individual competitions will be conducted for Recitation, Recitation- Religious verses in Sanskrit and Arabic, Light Music, Fancy Dress, Drawing, Storytelling, Action song, clay modeling and Yogasanas whereas group competitions will be conducted for Folk Dance, Patriotic song, Kolata, Quiz etc. Students who seek admission under Right to Education required to produce the below mentioned documents to all the schools they apply in order of preference. Those who wish to apply for admission under RTE quota may use the link given below, candidates required to take the print out of the same once all the columns filled with relevant data. Students parents or guardians may check the list of neighborhood schools from the link given below, the link provides district-wise list of designated schools.